On this episode of Football 2 the MAX, Sean Garmer and Erik Watkins discuss the biggest games, storylines, and takeaways from NFL Week 1. 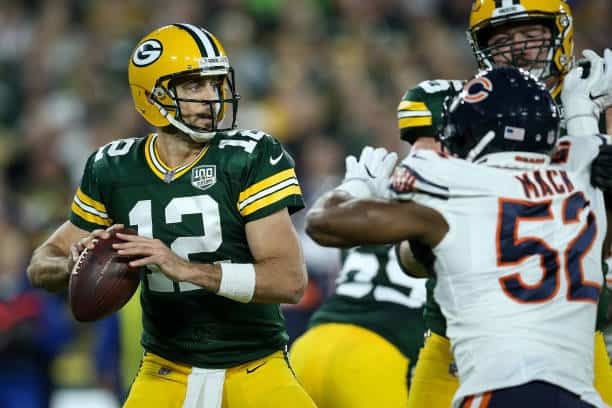 Aaron Rodgers pulls off a Willis Reed in the Sunday night showcase against the Chicago Bears. But how did the Bears defense hold up, and what about Mitchell Trubisky? New Orleans Saints and Tampa Bay Bucs just tore it up and put up 88 combined points. Does Ryan Fitzpatrick‘s performance do anything to cause a quarterback controversy? Somehow the Cleveland Browns and Pittsburgh Steelers ended in a tie. How did James Conner play? And does it mean anything for how the Steelers handle Le’veon Bell going forward? Is this Browns defense one to take seriously? The guys also talk about how the weather was a huge factor in several of the games. Patrick Mahomes and Tyreek Hill blowing up the Los Angeles Chargers. The rest of the games. Plus, Sean and Erik both going into hometown corner and give their thoughts on how the Dallas Cowboys and Jacksonville Jaguars performed in their first games. Football 2 the MAX is a podcast that focuses on what’s going on every week in the NFL. We have two shows each week, one on Monday nights after MNF discussing everything that happened that week and we also do a Thursday night show after TNF previewing the upcoming week as well. We also do off-season series with guests, cover the NFL Draft, and season previews as well. Basically we are your one stop shop destination for all things American Football. You can follow the guys on twitter @W2MSean, @W2MGary, @squidsportshead, or the entire network @W2MNetwork. Studied Journalism at the University of North Texas Born in Arkansas, his favorite college team is the Arkansas Razorbacks, but all of his professional loves come from the Dallas-Fort Worth area, where he spent 20 years of his life. So, that means Sean is a huge Dallas Cowboys and Dallas Mavericks supporter as well. Sean is an avid fan of watching football game film, learning about the history of NFL, and fantasy football. Most of his professional writing comes from spending years covering soccer in various forms, but he’s also covered football, wrestling, and video games as well. is a native of North Texas. He is also a graduate of the University of North Texas with aspirations of a higher level of education. Like a majority of Texans, football is his sports passion. Ironically, his passion for the game sparked from his love of Madden 98. From that point on, he has poured hours into studying NFL history and game film. Gary is a student of the game and is a die-hard Dallas Cowboys fan. His second sport is hockey, followed up by the rest of the American sports scene.